Dell Latitude 7285 2-in-1 business-centric tablet with wireless charging announced at CES. The new Dell’s Latitude detachable keyboard supports wireless charging using WiTricity’s wireless charging tech. Dell Latitude 7285 features a bright 12-inch 2880×1920 IGZO display. The 2-in-1 tablet is be powered by 7th-generation Intel Kaby Lake processors and up to 16GB of RAM. You will have the option to select Storage up to 512GB and a microSD card slot allowing more. The tablet supports Windows Hello-enabled IR camera. 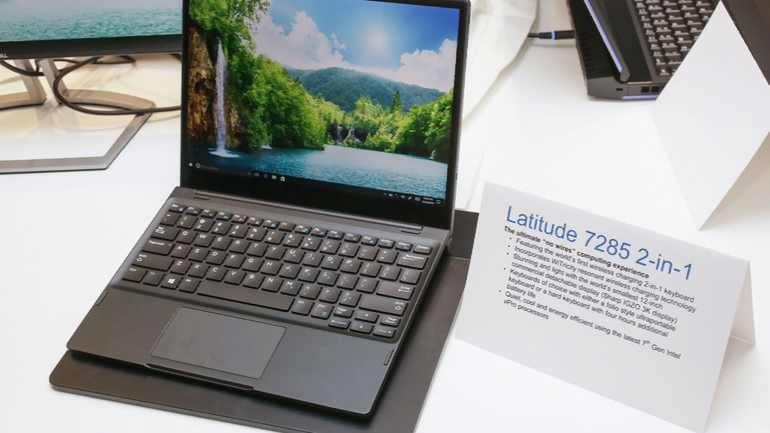 According to the company, the latitude 7285 2-in-1 can give up to 6 hours of battery life in tablet mode, or up to 9 hours when attached to its keyboard base. The keyboard is also available in two types, with one meant for extra portability and the other providing more key travel. You can order Dell Latitude 7285 on May 30, price details are not available yet.